Club Penguin Cheats by Mimo777 Club Penguin Cheats by Mimo777: Club Penguin EPF Message from Rookie! 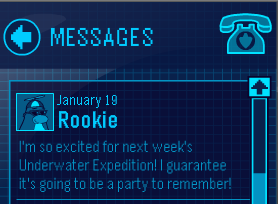 Hmm, what's gonna make this Underwater Expedition party so memorable? i have a bad feeling: crab activity, island partly sinking/tilting and rookie responsible for the party.. something smells CRABBY. What will happen? Cannot wait. Herbert is going to escape! i think i know what will make us remember it... the island is gonna be sunk forever and ever. Rookie going to sink island then the end. There's no point in that because that would mean the end for club penguin. IF it might sink then there (i belive) will be operations to raise the island again by example pushing the anvils off the island. Rookie trips next thing you know it we'll be at 115 degrees!! PLZ PASS THIS TO MIMO777. know is that Sensei keeps telling us to look for a sign in the elements. before Card Jitsu Snow is revealed by the elements and Sensei himself. Penguin Times' newspaper for more information from Sensei in the future. Make sure this reaches Mimo. After the island sinks, there will have to be a way to get it back up, right? We could attatch ballons to the island to make it float in the air, resulting in a FESTIVAL OF FLIGHT!!! -----------------------------------i want to add something to your idea. after the party Rookie will try to get it back up, but he messes up. so the island is still underwater, but you cant get the items and get into the member rooms. and a like a month later Gary has an idea to get the island back up, meaning another festival of flight AND a real epf mission not a field op. and i think the mission would be to find a bunch of balloons and stuff to get the island back up. that other comment that i put here was just a guess. i dont know if what i said is really gonna happen.